Of all the places I’ve excavated my favourite place is in the Labrador Straits for various reasons including the very friendly and helpful local folks, the sheer quantity of sites many of which are thousands of years old, the ease of excavation (everything is buried in deep sand) and the number of absolutely amazing sites. For example, those sites include the 8000 year old L’Anse Amour burial mound, the Basque whaling sites in Red Bay, and the oldest known site in the province in Pinware. Without a doubt, the archaeology of southern Labrador never disappoints. To this list of amazing sites we can add several Ramah chert biface caches. 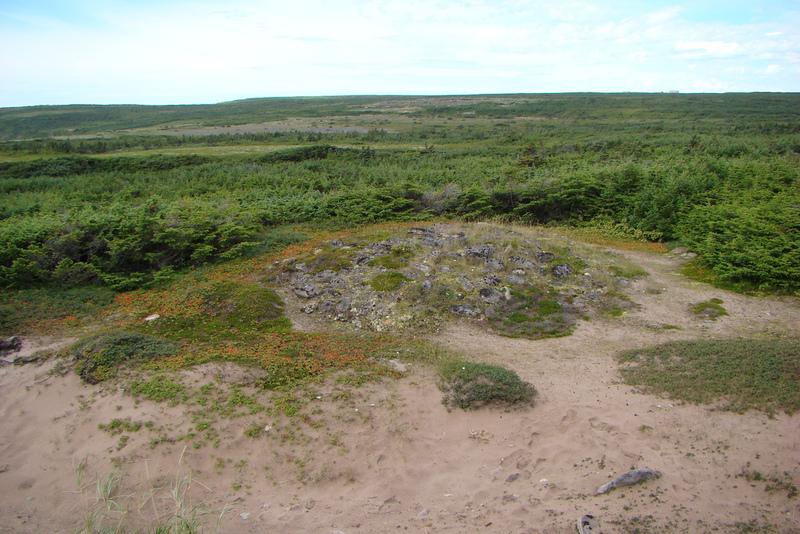 The sandy beaches of southern Labrador have long been of interest to archaeologists. Dr. Elmer Harp first excavated in the beaches in 1949. But local residents knew about the stone tools eroding from the beaches long before Dr. Harp’s first work. Lithic and more recent historic material continues to erode from these beaches to this day. L'Anse au Clair beach where the Spingle site was found. Just some of the artifacts collected by a collector from the Labrador Straits beaches. In May of 1990 Mr. Gordon Spingle was enlarging his vegetable garden in his front yard with a rototiller when the machine jammed on rocks. To Mr. Spingle’s surprise the machine had not jammed on regular beach rocks. 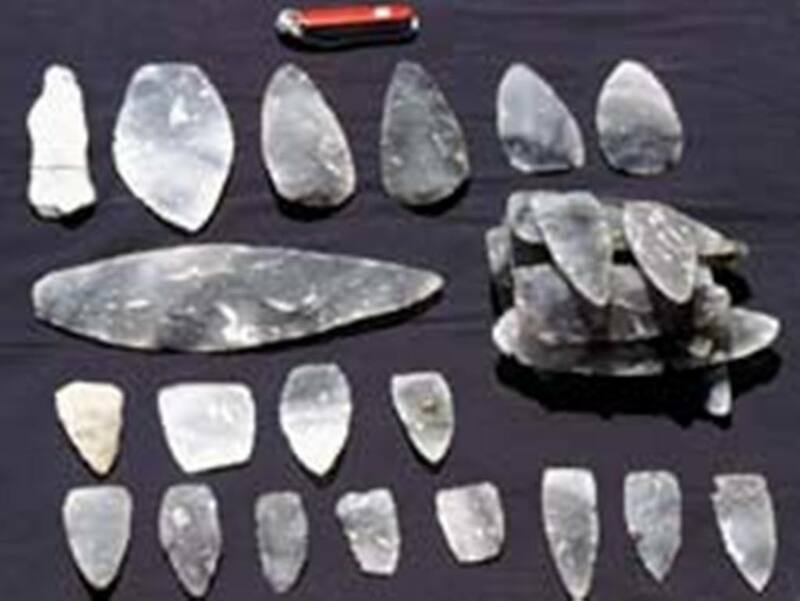 From the blades of the the machine he pulled 8 large Ramah chert bifaces that averaged 19 cm or 7.5 inches long. Shortly after he made his discovery Dr. Jim Tuck, who was already working in the area, was contacted and visited Mr. Spingle. Tuck’s archaeology crew tested the area around the original find and collected another biface bringing the total cache to 9 bifaces. Spingle cache, 9 Ramah chert bifaces. Since the discovery of the Spingle cache information on two other Ramah chert caches has come to light. In the fall of 1995 three hunters discovered a cache of 90 Ramah chert bifaces in the Alexis Bay-Port Hope Simpson area of Labrador. 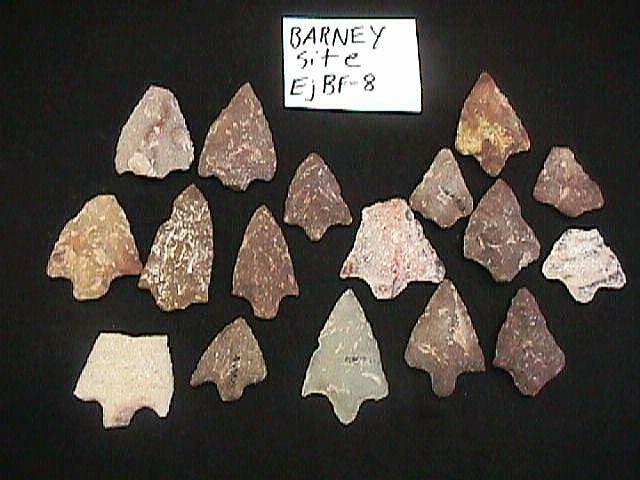 Fourteen of the ninety Ramah chert bifaces from the Port Hope Simpson cache. In the early 1970s Huey Stubbert from Kegashka, on the Quebec North Shore (~350 kilometers west of the Strait of Belle lsle) found a cache of 25 Ramah chert bifaces in his garden. In the case of the Stubbert cache we know the bifaces were stacked on top of one another. These photos don’t do the bifaces justice, they are spectacular. So, who made them, what were they used for? Given their size of some of the bifaces they were not hunting tools, many are just too large. Given their similarity in shape and material they were likely made by one person. They were all found clustered together in one very small area with no other traces of an archaeological site around them. Taken together the evidence suggests they may have been left as some form of ceremonial offering. But by whom? During the last glacial period, Labrador was covered in thick, heavy ice. This ice exerted a tremendous amount of weight on the land causing it to sink into the ocean. At the end of the ice age, the ice retreated and the land slowly rose out of the water. This process, called isostatic rebound, meant that the beach where these bifaces were found was underwater until ~3000 years ago. Given this date we can likely rule out the Maritime Archaic Indians as the people who made the bifaces because they vanish from archaeological record around the same time. Given their size the bifaces were not likely made by Palaeoeskimos who are better known for making smaller artifacts. So this leaves us with Intermediate Indians or Recent Indians as the makers of the caches. Since the Recent Indians don’t show up in the archaeological record until 2000 years ago it would make more sense that the makers of the caches were the Intermediate Indians. However, there are two pieces of evidence that suggests the makers were the Recent Indians. 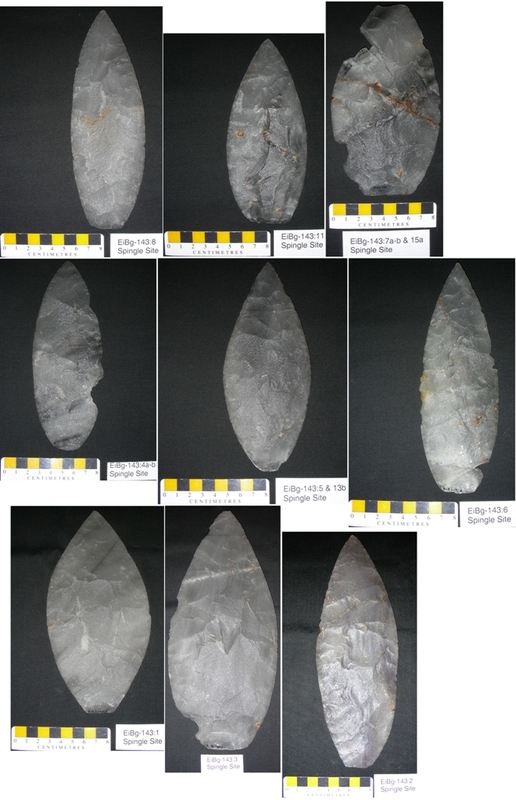 For one thing, bifaces with similar shapes have been found in Labrador Recent Indian sites. But, perhaps more convincing is the material the bifaces are made from. 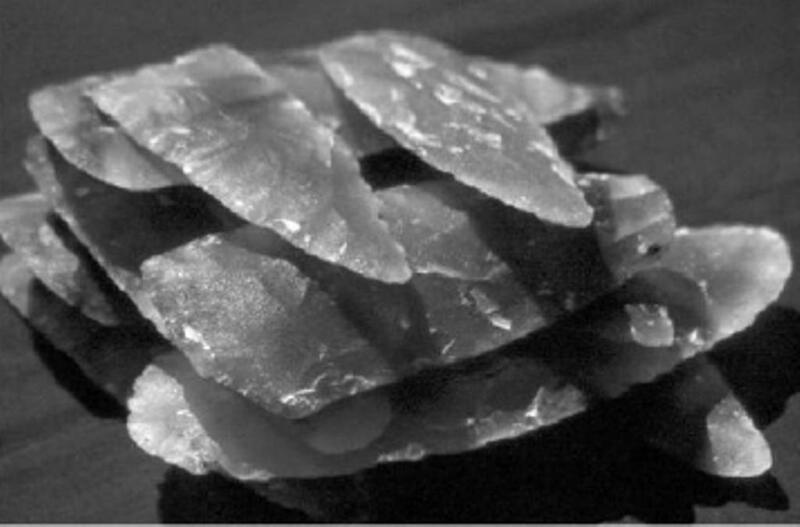 Anyone who knows anything about Labrador Recent Indians knows that they were completely devoted to Ramah chert, to the near exclusion of all other lithic types. This is particularly true for the people of the first half of the Labrador Recent Indian period (~2000-~1000 years ago) known to archaeologists as the Daniel Rattle complex. As spectacular as these caches are, they become even more so when you consider that the only known source from Ramah chert is more than 900 km north of the Straits (in a straight line) in Ramah Bay, northern Labrador. Ramah Bay in relation to the Labrador Straits. Very similar in form, size, and discovery contexts to bifaces found in caches in southern New England, where limited dating evidence suggests they date to the late 1st millennium AD, ca. AD 300-600. The only dated one is the Glazier cache (www.connarchaeology.org/ASC66.pdf), the largest with nearly 300 bifaces is the South Hadley cache. Like the Stubbert cache, the Glazier cache, when excavated, was found with the tips aligned and stacked. The South Hadley cache, though found by a farmer rather than having been professionally excavated, was also reported to have been found with the tips aligned in groups. Very interesting, thanks for your comments Ken. The Glazier cache bifaces certainly do look similar to the caches discussed here. Unfortunately none of the caches found here were found by an archaeologist and there are no precise dates for any of them. But based on site location and biface style I think they all fit within what we refer to here in Newfoundland and Labrador (NL) as the Recent Indian period which runs from ~2000 years ago to the contact period. Large Ramah chert biface forms (similar to the ones you show in the caches) have been found much further to the south (in Maryland) associated with Jack’s Reef burial assemblages (see Figure 7 at website: ). Recent excavations have revealed a Ramah chert Jack’s Reef point and other Ramah chert artifacts in situ at a Virginia Atlantic coastal site within a feature dated to circa 500 calAD (same website see Figure 20). With the early and marked appearance of Jack’s Reef in the Middle Atlantic region, you do see a few Ramah chert artifacts, a few nephrite adzes, and a few wedge-shaped micro-blade cores. What does this mean? Your guess is as good as mine! My gut feeling is that there seems to be a marked connection to the far Northeast at this time (i.e., down-the-line exchange, migration-movement, and/or episodic coastal interaction). Look for exotic Pennsylvania jasper in your far northeastern assemblages at circa 500 AD. You may find some….maybe not much….but some! Most folks would suggest that Jack’s Reef originated from the Great Lakes or Ohio Valley. There are some inconsistencies with this idea. I think the Jack’s Reef phenomena may have originated along the Atlantic coast and spread westward. Who are the progenitors of Jack’s Reef? Early Jack’s Reef notched points look technologically similar to Daniel Rattle points. Matter of fact, if Daniel Rattle points were made of jasper…..researchers in the Middle Atlantic and Northeast wouldn’t hesitate to call them Jack’s Reef notched or Raccoon notched points. Is there any exotic Pennsylvania-like jasper in Daniel Rattle assemblages? There may only be some flakes…in these assemblages. You folks are the only ones who can answer this question! I don’t profess to know the minor details expressed in the archaeology of Labrador or Newfoundland. Some researchers have noted that the marked appearance of Jack’s Reef in the Middle Atlantic is the by-product of a northeastern coastal Algonquian migration. If that’s the case, who are the ancestral folks…..Beothuk??? Got me??? You have some great data on this site! Keep up the good work! Wow, thanks for the comment. I was aware of the Riverton Ramah but obviously much more has been found. The time period you are referring to here would be the Recent Indian period (RI), ~2000 years ago to contact. There is a RI period on the Island of Newfoundland and in Labrador. On the Island it is clear the last of the RI became the Beothuk, it is possible (not as clear depending on who you speak with, I have my doubts) that the RI in Labrador became the Innu (Montagnais-Naskapi). It is the RI in Labrador who were heavily reliant on Ramah. One of the many Ramah & Labrador RI questions we have here is where did they get their Ramah? 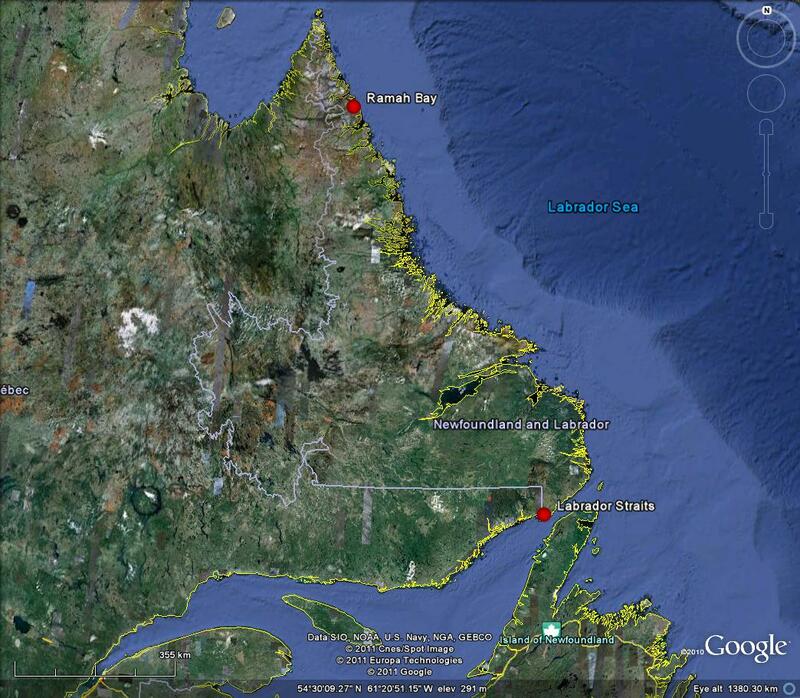 There are very few RI sites near or in the Ramah quarry area (far northern Labrador). Dr. Stephen Loring has speculated that they got their Ramah from Dorset Palaeoeskimo groups, likely via some form of trade. He is likely right. 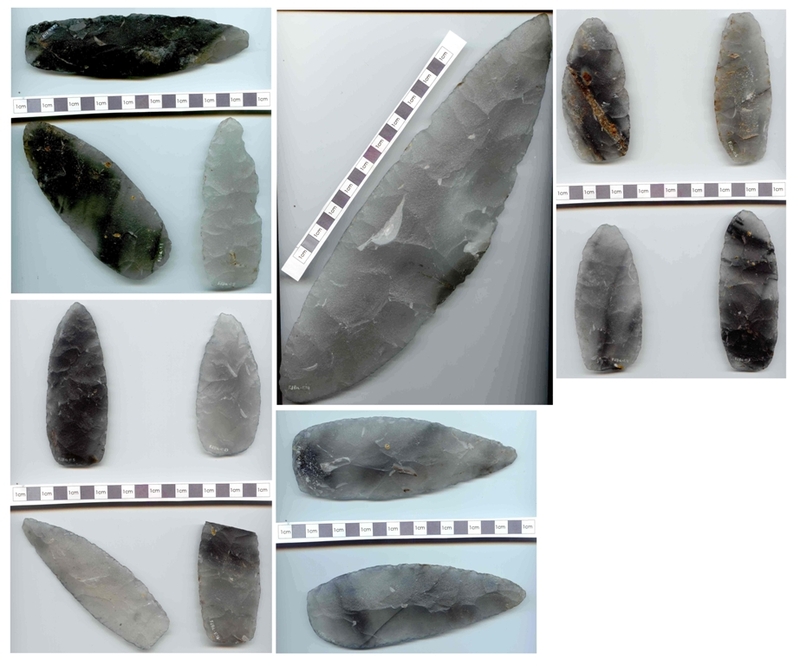 In this province the nephrite adzes and wedge-shaped micro-blade cores would be associated with Palaeoeskimo sites, they were the only ones here who used microblades (the Maritime Archaic used true blades but that is 1000 years older). I agree with you that there is ‘a marked connection to the far Northeast’. Your advice to look for Pennsylvania jasper is a good idea. It would not surprise me if something exotic like that showed up here. If they were trading down Ramah, it’s likely something was coming back up. I am not aware of any Pennsylvania-like jasper in our collections but you would be better off asking that question of Dr. Loring, he would be very familiar with the lithics associated with Daniel Rattle. Thanks for the compliment and the interesting comment. Darrin, really interesting stuff. I think I pointed out the similarities of the Island Field (Delaware) bifaces to those of the Change Island cache, and of both to a cache of 323 identical bifaces at the Haffenreffer Museum and of these to 30 cached bifaces from the Glasier site, Connecticut, which has two radiocarbon dates that calibrate to ca. calAD 325-600. This puts it into the “late Middle Woodland” in the general periodization used on this side of the border. Island Field has a fairly wide range of dates, but many from the burials clearly overlap those of the Glazier cache. At Island Field, the large bifaces are not found as caches, but are incorporated – generally just one or two at a time – with burials, some of which also contain Jack’s Reef points. Dated sites with Jack’s Reef or Raccoon Side-Notched (nearly identical points, the former being corner-notched and the latter side-notched) seem to fall into the AD 450-750 range. Similarities in ceramics across a wide region, the sudden appearance of Jacks Reef/Raccoon Notched points, and the distribution of specific lithic and other raw materials extremely wide regions – often in the form of Jacks Reef points, and the appearance of “monitor pipes” in ceramic or steatite forms are a range of potentially linked phenomena that suggest a period considerable interaction, trade, or mobility focused on this interval. Stuart Fiedel argued that this interaction sphere represented the migration of proto-Algonquian people across the northeast from a homeland in the Great Lakes. Jay Custer argued (based on Island Field) that this period saw the rise of ranked societies along the Mid-Atlantic seaboard. Others have argued that Raccoon/Jack’s Reef points represent the first true arrow points and that these transformations signal cultural reorganization and upheaval during a prehistoric “arms race.” Still others have argued for a cultural florescence along the eastern seaboard in a post-Hopewellian world, with realigned identities and alliances but using aspects of the movement of raw materials that we see as the Hopewellian interaction sphere to create something new after it collapses. If any of the Island Field bifaces are actually Ramah quartzite, it certainly implies a network or chain of interacting societies of remarkable extent. However, I’ve never before heard of anyone identifying the Island Field “macro-bifaces” as being definitively Ramah. Is there a reference to that identification, with information on how the identification was made?